IS STEM CELL THERAPY FOR HAIR LOSS EFFECTIVE? While you go through your old photographs, you would have noticed how things have changed from loads of hair ‘back then’ to the thinning scalp now. The very name hair loss is enough to give nightmares to people in a society where looks are as important as their achievements. Looking at the extent of ads and videos offering miracle cure for hair loss we can judge the extent to which we are obsessed with the phenomenon. There are countless oils, shampoos, and treatments, to grandma remedies that offer solutions to thinning hairlines. And then there are hair transplantation treatments where hair is grafted on to the scalp. the loss of hair on the scalp could be either due to a decreased blood supply to hair follicles due to autoimmune disease, hereditary or aging or due to inflammation. A scientific term for hair loss is androgenic alopecia (AGA) seen in 80% Caucasian men, while in ladies it is female pattern hair loss that is seen in 32% women. The treatment of AGA is pitched at a revenue of US$4 billion so we can imagine the quantum of treatment! There are several treatment options such as the use of FDA approved medicines: Dutasteride and Finasteride prevent the conversion of testosterone and require prescriptions while Minoxidil causes an increase in blood flow and hair growth. There are also non-prescribed natural molecules reported for therapy such as procyanidin B-2 from apple extracts or palmetto extract or Green tea; these treatments have not reported any mechanism of action though! Another treatment option is the use of lasers that use heating by electromagnetic radiation: whose energy penetrates the scalp leading to increased blood flow and signals that cause hair growth. The use of platelet-rich plasma (PRP) has also shown promise in hair regeneration due to several growth factors. The quest for other treatment options has led to the exploration of stem cells as treatment options. Several molecules are produced by stem cells that cause hair growth such as epidermal growth factor, insulin-like growth factor, hepatocyte growth factor etc., all-cause signaling cascades leading to hair growth. So do we have a winner here? Is there potential for use in therapy? A study reported in 2015 explored the use of stem cells derived from fat or adipose tissue as the treatment for baldness or alopecia. The medium used to culture stem cells isolated from fat was injected into bald patients few for sessions over 3-5 weeks. The patients’ hair analysis revealed an increase in the hair numbers in both genders irrespective of whether they took conventional medicine. This growth medium contains several molecules that promote hair growth such as hepatocyte growth factor, vascular endothelial growth factor etc. and was reported to be the first step towards treatment of hair loss! In a study published in 2017, scientists isolated stem cells called human follicle stem cells collected from the scalp of male patients with AGA. 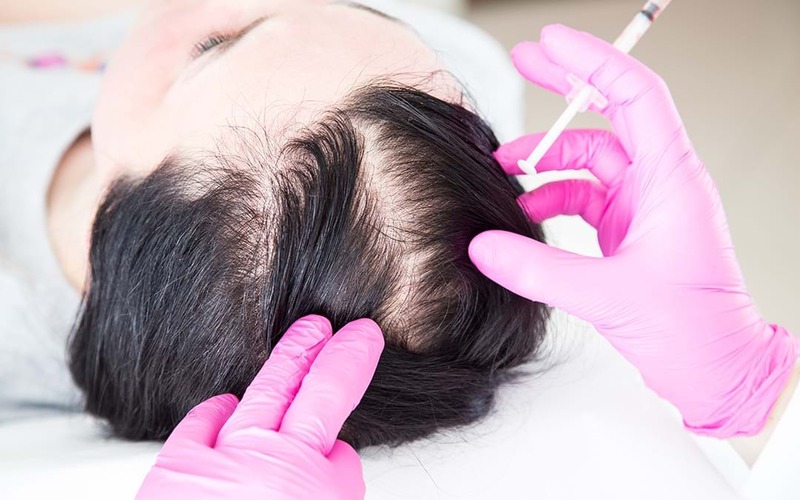 Following enrichment of the stem cells, they were injected onto the scalp and then the pattern of hair growth was measured. There was an increase in hair count and density over 23 weeks post injection of the stem cells with values reaching 29%±5%. The authors reported this growth of hair using isolated stem cells as a first towards larger studies in pattern baldness scenario. We can see that in a society where an emphasis is on looking aesthetically presentable, treatment of hair loss is an area of importance. The latest addition to the armory is stem cell treatment that has shown promise with minimum side effects. With more statistically significant numbers and further research and trials, we can be sure whether this approach can hold promise so that everyone can have flowing and glowing crowns of glory!